My Creative Time: Guest Designer for Trendy Twine today! Good morning my creative friends! I am so excited to be the guest designer over at "Trendy Twine" today. You can head on over there to see more pics of this SIMPLE & CUTE little treat box! Fun treat box. I love the 31 brad. Awesome job Emma!! Such fun papers and great twine!! Have a GREAT Saturday!!! I love this Emma, I think I'm going to have to make some for my girls! Thank you so much for guesting with us at Trendy Twine this month! This is so cute, Emma! I am loving that paper!!! 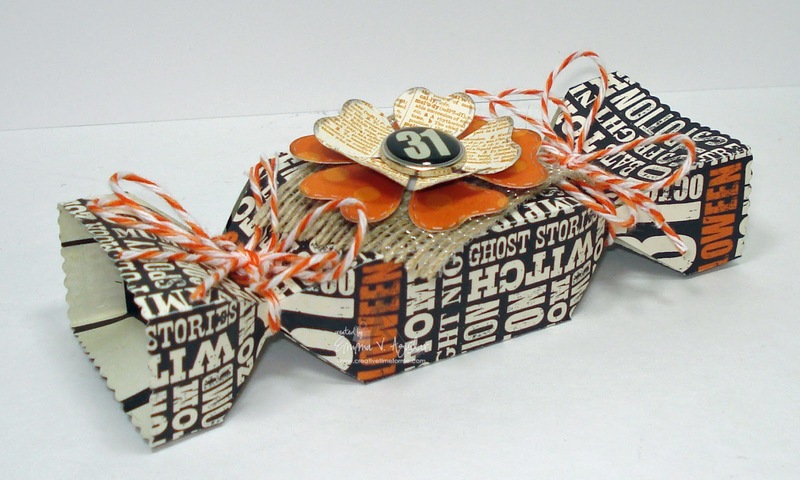 The papers are perfect for your Halloween Treat Box. What better to tie it with than the twine? Love it...great job! Your bubblegum box is super cute! This treat box is adorable, I just love how you decorated it with the flower and brad. MCT and TT are two of my most favorite companies so this was an awesome combination! Thanks for being a guest designer for us over at Trendy Twine! Hi Emma! I LOVE the Bubblegum Treat Box die and I own one...! Emma, your box is so cute, it looks so yummy. Love the Halloween theme. I am so glad I got that die. This is so cute my friend. Love the box and the twine you used. Thanks for being our Guest Designer over at Trendy Twine. Totally lovin' the treat box. I love how you mixed your dies to create this stunning treat box. LOVE IT! Thank you for guesting with us. Emma, I just love all the details on this cute treat box! We are so lucky to have you guest designing for us at Trendy Twine! Fantastic! What a great idea! Super cute! Thanks for being our guest designer at Trendy Twine! Love the twine added to your fabulous treat box. So fun! What a wonderful treat box! I love the paper and the texture that the twine and burlap add. I also love the "nod" to Halloween with the colors and brad, but with the sweet touch of flowers! Wow, your treat box is really cute! Great job Emma, as always. Emma ~ Oh my I would NEVER open this!! It is PERFECT!! Well you know how I feel about your products but the paper and that button! eeek! Let's not forget about the twine either! Simply LOVE!!!! I love this cracker! Perfect papers and embellies. Great job and thanks for guesting over at Trendy Twine! This is so cute! Thanks for guest designing with us! This is ALL kinds of cute! Great project. It was wonderful to have you on the TT blog to guest design for us!